Two US Navy cruisers CG-61 USS Monterey and CG-68 USS Anzio are in Black Sea currently. USS Anzio is on the east end of the Black Sea. She will dock in Georgian harbor Batumi tomorrow and will stay there till 12 June 2011. The U.S. warship and the Georgian Coast Guard will engage in damage control exercises as well as engine and electronics maintenance work, according to Georgian news portal civil.ge. The other cruiser, USS Monterey is in Constanta, Romania will stay till 9 June there. According to the US Embassy in Bucharest, the ship will donate eight pallets of school supplies, sports equipment and medical items will be distributed to orphanages, kindergartens and clinics in Constanta and Tulcea counties. The eight pallets, weighing almost two tons, contain soccer balls and nets, health kits, hospital linens and school bags. In the school bags are notebooks, pens, erasers, rulers, pencil sharpeners, pencils, crayons and scissors. 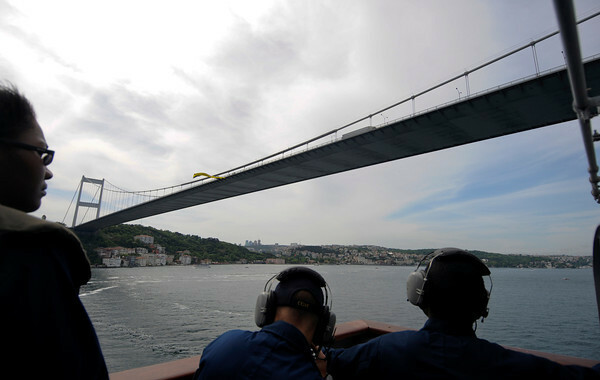 Those cruisers are not the only US Navy ships in the Black Sea. The salvage ship T-ARS 51 USS Grasp is in Odesa, Ukraine to take part in the naval exercise Sea Breeze 2011. She will stay in Odesa till 16 June 2011. This is a rare concentration of US Navy warships in the region, since the Russo – Georgian war in 2008. I AM so proud of my navy! Truly a “Global Force for Good”…. even the czar is trembling! HA! Bless all that go to sea to keep this world free.